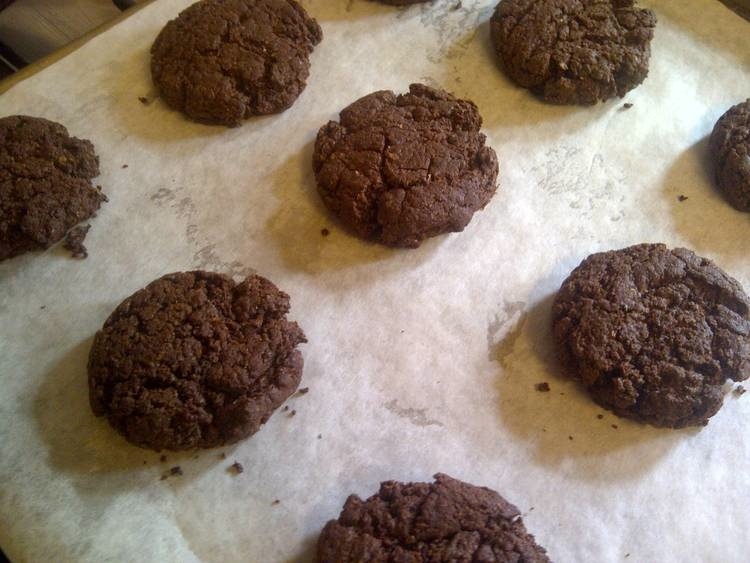 I’ve called these ‘bitter’ because they are not overly sweet and they are made with whole wheat flour, so along with the cocoa it all combines to give a slight bitter taste, but in a good way. I adapted them from a recipe I found online which was neither chocolate nor mint! I was really pleased with how these turned out and will definitely be making them again. They don’t feel too naughty because of the whole wheat flour but the chocolate mint taste ensures there’s no compromise on the yumminess. 1) Sift the cocoa powder and them combine all the dry ingredients. 2) Melt the butter, add this along with the peppermint and milk to the dry ingredients. 3) Mix until it all pulls together. The mixture seems quite dry, only just holding together, but if it seems too crumbly, you may need to add a little bit more milk. 4) Use an ice-cream scoop to put even sized dollops of cookie mixture onto a baking sheet covered with baking parchment. These cookies do not spread out when cooking, so press them down gently with the back of a wooden spoon, leaving them quite chunky. If your ice-cream scoop is the same size as mine, then you’ll end up with 14 cookies. 5) Bake in a pre-heated oven at 180C/350F for 10 minutes. I’ve never made cookies using whole wheat flour. Does it make them a little drier or is it really not noticeable with the mint? They actually taste a lot better than they sound or look! They’re not like some healthy treats you can get that taste healthy but don’t taste like treats, ya know? They’re not particularly photogenic, but they taste good, if you don’t mind your biscuits not too sweet! Sound yummy, but.. how much is a cup….? Ha! I think you can use a coffee cup; as long as the proportions of the ingredients are the same then it should work! Not as easy to figure out half or quarter of a cup though without the proper measuring set!